Why is John a Community Builder? After a very successful career in journalism, John resigned from his job at a prominent broadcaster to pursue greener pastures – or rather, greener fields. Realising the opportunities presented by the 2010 Fifa World Cup, John decided to start a project to build soccer fields and improve sporting infrastructure in South African townships and rural communities. 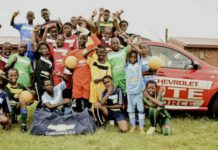 The project has grown and now includes distributing Dream Bags (which include soccer balls, boots and kit) in under-resourced township soccer teams and rural areas. 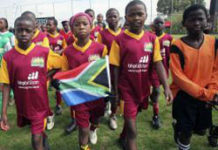 Dreamfields is not only giving a lot of township youngsters “a piece of the action” that is surrounding the Soccer World Cup, it’s also helping to keep kids away from ever-present temptations like crime, alcohol and drugs. John promotes the spirit of giving and generosity, which does not always mean donating large sums of money, but giving others a chance to realise their dreams. 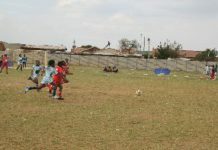 Dreamfields uses its donations in three ways: to fix up existing sporting infrastructure in townships and rural areas; to supply Dream Bags to as many needy communities as possible; and to create new fields. Dreamfields has received endorsement from the Minister of Education. John presented the AM Live show on SAfm Radio Talk-show for over a decade. BHP Billiton has invested R6.5-million in the Dreamfields Project, while Old Mutual has committed R6.2-million. By 16 June 2008 (Youth Day), 169 Dream Bags had been donated to needy schools. For the price of R5 500, plus transportation, you can donate a Dream Bag to a school in need. For more options on how to support the project, visit The Dreamfields Project. Story published on SAinfo on 16 July 2008.